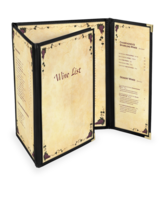 IDEAL COVER FOR RESTAURANTS THAT NEED TO PROTECT THEIR PAPER MENUS FROM FOOD STAINS. 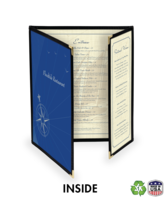 Menu covers with clear vinyl panels, double row stitched with colored trim and finished with metal corners. 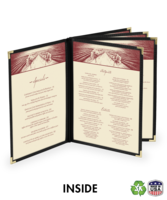 Your paper menus load from either the top, on single panel covers, or from the open side on multi-page menu covers. Panels are available with your choice of 10 GAUGE, crystal clear APET Rigid Polyester, with either polished or non-glare matte finish, which is environmentally safe and of archival quality. Laser / Digital printing will not migrate to our clear pockets, unlike standard pockets made of PVC. 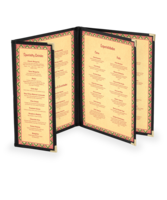 Trim is available in either imitation leather with cotton-woven backing, which gives extra strength and prevents cracking, which you will see in many other cafe style menu covers, or nylon/cotton blend of ribbed Bengaline fabric. Either version is available in a full array of colors. 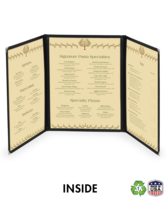 Durability: - Menu Grade APET Rigid Polyester for clear panels. More scratch resistant than graphics-grade vinyl. Harder vinyl eliminates migration of printing to inside surfaces of vinyl, vinyl lays flat! Average cover life 2 plus years. Easy to clean: - Wipe with damp cloth. For stuck-on food particles add 1 drop of mild dish washing liquid per 6 oz. clean tap water. Make sure to wipe off all remaining soap film when you are done. 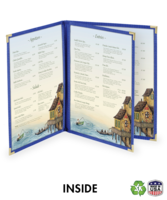 Waterproof Backing: Menus can get wet in restaurants. It's a fact of life. We use cotton woven backing which will not absorb moisture and keep binding water tight. More expensive than plain scrim backing. It's a fact of life. Choice of sizes and colors: Unlimited sizes, 6 popular imitation leather binding colors, fourteen colors in fabric binding. •Your choice of 10 GAUGE APET Rigid Polyester, clear vinyl panels, with either polished or non-glare matte finish. 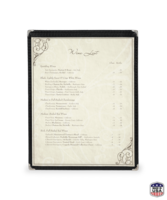 •We use menu grade clear panels which will not crack, yellow or lift laser print from your restaurant menus. 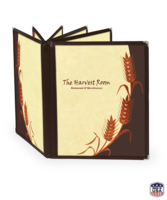 •Choose from either leatherette embossed vinyl binding with cotton woven backing or thicker, woven fabric binding, each available in a variety of colors. The edges of either binding material is folded under to make a finished edge, then DOUBLE ROW stitched to the clear menu panels with text 70 nylon thread, which is nearly impossible to break. 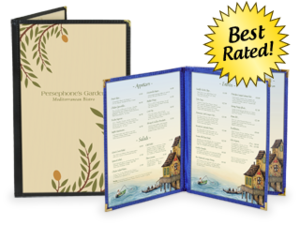 • But most important, our restaurant menu covers will last longer than any others being offered on web and we back up that claim with our guarantee. 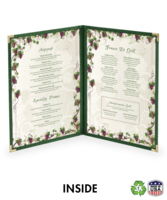 Click here to find out more about our restaurant menu covers, and why we can make this claim. 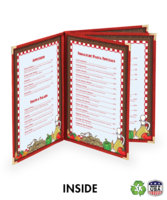 Please note: these menu covers are non-stock items. Please read our return policy before ordering. 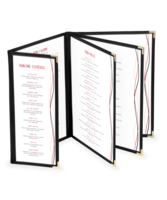 Restaurant Menu Covers with Clear Panels and Leatherette or Fabric Binding. Shop online with the Menu Shoppe today.